If you’re a retailer without a mobile app, it might be time to think about building one. And if you already have one, it may be time to review what the user experience like. Because mobile commerce growth is stronger than ever. Not only are U.S. consumers spending up to five hours a day on mobile devices, they’re downloading more shopping apps – shopping app downloads grew by 20% in the first half of 2017. Criteo’s latest Global Commerce Review reveals that worldwide, in-app transactions increased 64% from 2016. In North America, advertisers with a shopping app now generate more than 50% of their sales on mobile. In the U.S. specifically, apps accounted for 68% of transactions on mobile devices and 71% of mobile sales from committed advertisers (retailers and brands that used retargeting technology). Of course, having an app and having a usable app are two different things. Retail app optimization is the key to building an omnichannel shopper experience. So how do you make sure your app is truly optimized? Smartbanners – a pop-up banner in the web shop that provides a link to directly download from the app store. Deep links that enable your shoppers to seamlessly move from web to app. Encourage existing shoppers – shoppers who purchase from your web shop are most likely to be interested in your app. Take advantage of this interest by implementing a dynamic retargeting campaign. Pomote your app to them when they purchase from the web store or via your packaging. In-store promotions – train your staff to use and promote the app. Also let your customers know via in-store signage that your app can enhance their in-store visits with in-app product scanners, coupons, and loyalty programs. Social media – when promoting your app via social channels, turn your CTA buttons into “use app” buttons that take shoppers directly to the app from their social feeds. Yay! Now your shoppers are in the app. Now what? Today, a seamless shopper journey must be omnichannel. Criteo’s Global Commerce Review found that 30% of desktop sales are preceded by a click on mobile, meaning many shoppers are using apps to browse before going through another channel to buy. The best apps are designed for both in-store and online functionality. Web orders should sync and be visible in the app and vice versa. With real-time inventory services, inventory available on web and in store should be available to users across all channels. 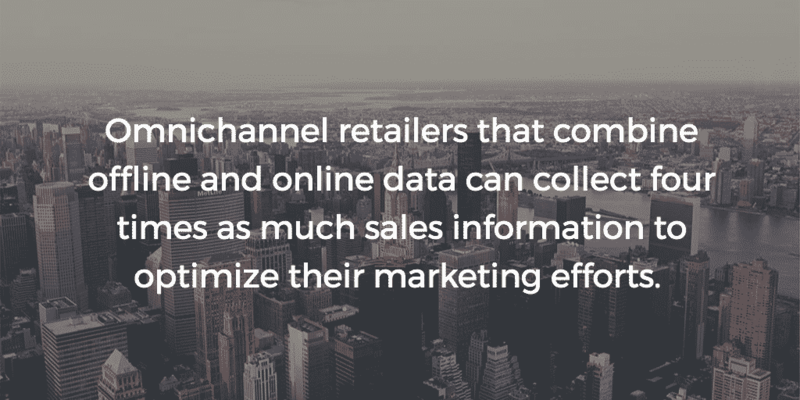 Criteo also found that omnichannel retailers that combine offline and online data can collect four times as much sales information to optimize their marketing efforts. In-store activations, social media promotions, and website UX must all sync up with your app so that customers can easily browse and buy across all channels. Every app is a work-in-progress. To truly know what shoppers want, you should actively seek and implement customer feedback. A survey by Alligatortek on app longevity found that while ecommerce apps are the fourth most-downloaded types of apps, they’re also the fourth most often deleted, perhaps indicating many retailers are not responding quickly enough to customer needs. Minimize your app abandoners by constantly analyzing interface and content and updating often. Social media has made ecommerce an interactive experience. By encouraging app users to share their experience with friends, retailers can build social proof within the shopper journey. This is where user-generated content can come into play, too. Consider integrating a social platform on the app where shoppers can share their own content and experiences to keep them engaged. Engage repeat customers with special deals, coupons and discounts to both encourage them to shop at your brick-and-mortar stores and reward them for using your app. These little nudges go a long way to ensure your loyal customers keep coming back. Your app is there to make your shopper’s life easier and the shopping experience better. Products, along with reviews, product recommendations and everything else should be easy to find, browse, and view. Shopper payment information should be stored for ease of repeat purchasing. Should your customers need assistance, it should be easy to find. Consider adding a chatbot or phone number that connects to a real person. Though if your app is fully optimized, hopefully your customers will never need it! Optimizing your retail app is no small undertaking, but Criteo’s Global Commerce Review indicates that it’s a strategy worth investing in as app usage shows no signs of slowing down. Across regions, the numbers speak for themselves: In North America, retailers with a shopping app now generate 68% of sales on mobile devices. In Europe, Brazil, and LatAm, it’s 44% while in APAC, 70% of retailers are relying on shopping apps to generate mobile sales. Today’s shoppers may be active on all browsing environments, but what’s clear is they’re buying more on-the-go on their mobile devices, with apps enabling a majority of the sales. Gain more insights into today’s omnishopper and explore our Global Commerce Review by clicking below!